My boys have been outside so much this summer that the playroom has hardly been touched. We have had a few very rainy days in the past and it is always good to have a few mom tricks up your sleeve. Since there have also been some particularly muggy and hot days coming up, and I have a home daycare, I thought I might bring out our rainy day / Magic Jar again! Basically I found an empty jar and some scrap paper. I wrote down as many simple activities as I could think of, on the paper and put the individual papers in the jar. Now you could go all out and decorate the jar too if you'd like. Throughout the day each child had a chance to pull an activity out of the jar. It helps to have all the supplies ready to keep your day running smoothly. I used old gift bags to prepare for each activity. They were all lined up in my bedroom ready to go so we wouldn't have trouble with transitions. Once it looked like an activity was winding down we moved on. 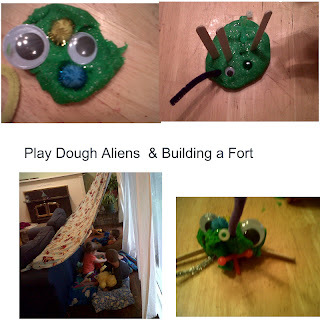 Play Dough Aliens - we were given some fun green sparkly play dough. We added some small craft supplies to make these great aliens. Build a Fort - this was simply a large bed sheet that we attached to the curtain rod and draped over the couch. The kids ran and gathered pillows, blankets and toys to play with. Later we had a rest and stories in the fort. Balloon Tennis - we made some simple paddles out of cardboard and popsicle sticks. Add in a few balloons and you've got a lot of fun! 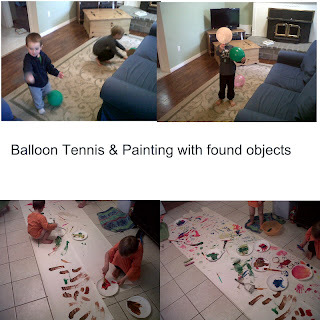 Painting - we unrolled some paper on the kitchen floor and used paint in tubes and some washable paint along with a variety of interesting object. We used whisks, grass, feathers, hands, cookie cutters, etc. to paint with. I'd love to hear you ideas for some more activities to add to the jar.